Rugby has the highest risk per player/hour of injury of all sports. 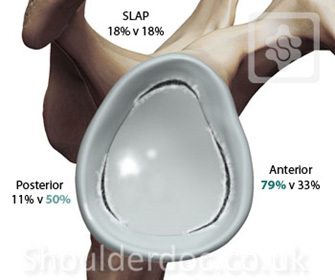 The shoulder comprises 20% of all rugby injuries being the second most commonly injured joint after the knee. 35% of all injuries of the shoulder are recurrent injuries and if a player has sustained an injury of one shoulder there is a higher likelihood of that player sustaining an injury of the other shoulder. The manoeuvre most strongly associated with shoulder injuries is the tackle accounting for 49% of injury episodes in rugby matches. The shoulder itself mechanically is an inherently unstable joint. Traditionally we think of the shoulder as a seal sitting on an unstable platform and balancing a ball on its nose. The unstable platform being the scapular thoracic joint and the seal balancing the ball being the gleno humeral joint. 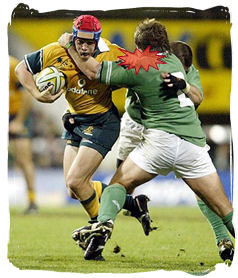 In rugby players this inherently unstable situation is stabilised significantly by well developed surrounding musculature; thirteen muscles make up the shoulder joint and this biomechanical protection provides a significant stability and protection to the vulnerable and potentially unstable glenohumeral joint. Another part of the important stabilising affect comes from the chuck block affect of the labrum; in well muscled rugby players this becomes the weak point in shoulder injuries. From our clinical reviews of treating 211 elite rugby players over 6 years, we have been able to collect a lot of unique data, developed a much better understanding and refine our techniques and outcomes in this unique high-demand group of athletes. Aspects of this data have been published and presented. In this article I will describe a set of unique injury patterns sustained by rugby players to their shoulder which I have come to term “The Rugby Shoulder”. Direct lateral blow with the arm at the side (Direct Impact) (internally rotated) (32% of injuries) - this either occured when being forced to the ground holding the ball, or on direct impact tackling. The Direct Impact group sustained a complex pattern of shoulder injuries, with a high frequency of SLAP and posterior labral tears. Players reported at the time of injury the feeling of a pop, a dead arm feeling and inability to continue playing that game. Thereafter they often were able to return but not to the same level of play. They have lost confidence in their shoulder, avoiding tackle on the affected side. Clicking and clunking was a common symptom. Another very common symptom was that of pain with bench pressing. The pain was felt particularly on descending or eccentric loading of the biceps. The typical history of this rugby shoulder therefore was a big hit involving a tackle or a fall onto the shoulder or a direct blow. There was big pain at the time of injury and they were unable to continue the match. The recovery after the injury is stormy and slow with great difficulty performing resistance weight training activity of the shoulder. In 2011, we undertook a video-analysis study to better define the mechanisms of injury in rugby. The details of the study were presented and can be seen here. The commonest causes/mechanisms were defined as the ‘Try-Scorer’, ‘Tackler’ and ‘Direct Impact’ mechanisms. Another less common, but significant cause of posterior capsulo-labral injury was the ‘Elbow-Fall’, landing heavily on a flexed elbow and shoulder. ‘Try Score’ injuries are caused by hyperflextion of the outstretched arm such as when scoring a try. It involves a lever force on the Glenohumeral joint, resulting in rotator cuff tears along with Bankart and anterior capsular tears. The ‘Tackler’ injuries is characterized by extension of the abducted arm behind the player whilst tackling. This mechanism involves a lever force on the glenohumeral joint (GHJ) and can cause GHJ dislocation with Bankart, reverse Bankart and superior labrum anterior-posterior (SLAP) tears. We found that the most common injury sustained was a labral injury making up 42% of all the shoulder injuries. 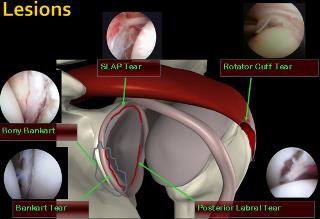 Rotator cuff tears only comprised 4.5% of the injuries presenting to our service. In rugby union there was a little difference in the injury patterns, except for bony Bankart lesions were significantly more common in the backs. This is probably because they sustained more ABER injuries consistent with the open play and more outstretched tackles and score trying than the forwards. Ultrasound Scan - this is simple and quick if available in the office and can show a rotator cuff injury, Hill-Sachs lesion and AC Joint injury. The majority of the players sustaining a 'Rugby Shoulder' injury were unable to return to the pre-injury level of play and required surgical repair. Surgery tended to performed early or mid season in 64% of the players and towards the end of the season in 36%. All procedures were arthroscopic , except for 16 cases which were open modified Latarjet procedures for glenoid bony deficiency. These cases also had any asociated injuries repaired arthroscopically prior to the modified Latarjet procedure. After surgery we use an accelerated rugby rehabilitation protocol that we have developed with professional rugby teams. We work closely with the team therapist, conditioning coaches and coach to ensure a safe and rapid return to play. These athletes get a level of support and input that is not available to amateurs and therefore can be progressed more rapidly. Tissue healing is also rapid in athletes. The rehabilitation is based on functional movement patterns and incorporates early sports-specific exercises. A sling immobilizer is used for less than one week. The first three weeks comprise of closed kinetic chain exercises which incorporate proprioception, core stability and scapula stabilizing exercises. These are done within the safe zone and progressed as tolerated. Pertubation training is introduced after three weeks and functional open chain exercises introduced. Depending on the athletes' progress, resistance exercises are introduced after approximately six weeks, along with skills training. Simulated tackling is started at about two to three months. Impact and tackle bag training is not started until the athletes have achieved satisfactory movement, strength, isokinetic and proprioceptive criteria. Using a 15 point vision analogue scale where 15 is no pain and 0 is maximum pain, the pain scores improved from 5 preoperatively to 12 at six months postoperatively. Patient's satisfaction improved from 11% preoperatively to 93% at 6 months. We do not put a specific time restriction on return to play. The player has to meet specific progressive goals to progress in the rehabilitation proccess. These goals are both sport and psition specific. A player cannot progress unless he has achieved the predetermined goals. The decision to progress is mainly led by the club therapist, in dicussion with myself. Return to full play is then a natural progression of recovery rather than a time-determined event. Looking at their return to previous maximum level of play, 89% were able to return at 3 months, 94% had returned at 6 months. 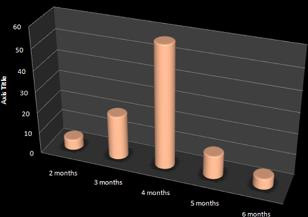 The average time to return for all surgery was 4 months overall. Over a six year period the recurrent injury rate was 5.6%. All had sustained a recurrent traumatic event. Of these, four patients had a glenoid bony injury with bone loss and required a modified Latarjet procedure. Two patients had repeat tears of the initial repair site and another two had tears elsewhere, with the initial repair having healed and being intact. 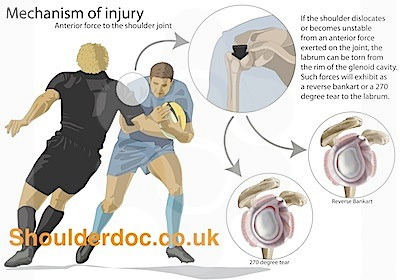 In summary, the typical 'big hit rugby shoulder' involves a big hit, big injury, unable to return to previous level of play, unusual distribution of labral tears without a true dislocation. These generally require early fixation. The results of surgery show a >90% return to full activity within 6 months. The next type of 'rugby shoulder' is what I term the 'Grumbling AC Joint'. In our review of the rugby shoulder injuries, the second most common shoulder complaint was AC joint pain, making up 28% of our population. The typical history is that of repetitive minor injuries to the shoulder. Pain is felt with extreme overhead activities. Clinically the Scarf or cross-chest deduction test is positive, tenderness over the AC joint itself as well as AC joint compression test being positive. The pathological findings are varied from meniscal tears of the AC joint to AC joint arthritis and Osteolysis of the lateral end of clavicle. Arthroscopic AC joint excision was undertaken where required. Our results of 12 professional rugby players, over the one year period, revealed a mean return to play of 6 weeks following AC joint excision. However it is worth noting that 10 of the 12 were done at the end of the season, only 2 done mid season. With this type of injury players are normally able to play through the season with the aid of physiotherapy and AC joint injections, often attending for their surgery at the end of the season. The initial treatment in-season is injection and rehabilitation with plan to perform AC joint excision at the end of the season, if required. Single big hit and unable to return to the same level. Posterior and superior labral injuries are more common than in other populations. A true shoulder dislocation is uncommon. Arthroscopic repair results in an early return to play. Inject and excise arthroscopically at the end of the season. Return to play usually within six weeks.